Reminiscences of John Dingley | Launceston Then! John Dingley was born in 1829 to Richard and Ann (nee Pearse) Dingley in Broad Street, Launceston. His father was at first a grocer and watchmaker in the town operating out of a shop that was situated next to the Town Hall/Assizes Court in the town centre (below). Richard later became the agent for the Tavistock Bank eventually relinquishing his grocery business in 1839. John had an older sister Eliza Jane born in 1828. His mother Ann passed away on the 14th of January, 1855 and Richard later married Grace. By this time Richard was also farming a farm of 280 acres. John Dingley’s drawing of the Town Centre in the 1830’s. My Father left behind him some few memoranda addressed to Your Mother and myself in the form of letters. And the value I set upon these coupled with the desire for fuller particulars, lead me to think some similar memoranda may after my decease be valued by you. The old house in which I was born you never knew. It stood where the present butter and poultry market stands (this was demolished in 1921 to make way for the war memorial). And was pulled down to make room for the present buildings while I was a boy at school in the year 1841. It was a remarkable old house without a bit of backlet or court, with street on three sides, on the other side a narrow house (occupied by a shoemaker called Rogers who carried on a large business) which was apparently jammed in between my fathers house and the Town Hall. 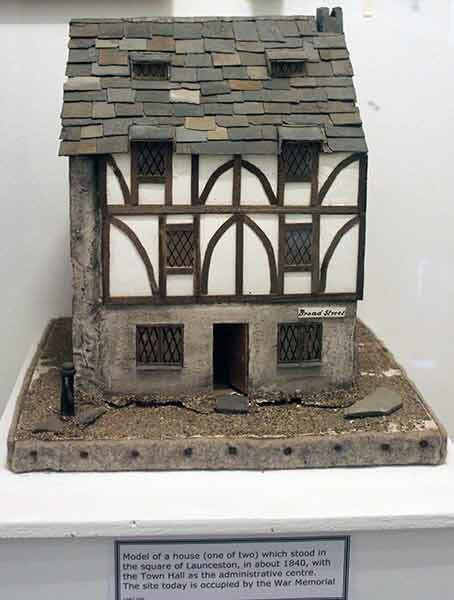 The above ground plan was roughly how the three buildings looked (also below courtesy of Lawrence House Museum). Your Grandfather as you are aware began life as a grocer and watchmaker the latter business I never remember, and I cannot remember his commencing the Bank, the grocery business he carried on till I was about ten years old, but he was chiefly occupied in the Bank and your grandmother and I were his only helpers. I give you a basement and other plans of the old house as well as I can remember. 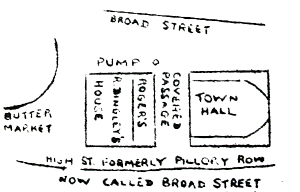 John Dingley’s drawing of the house lay out. The Dining Room was a fine room pannelled all round, with an ornamental ceiling and lofty chimney piece of the style of Charles I or rather to speak more correctly the style was Tudor, there being no classical or Elizabethan details, but it was not uncommon to build in this style in remote districts down to the middle of the 17th Century. The house had however been so patched and altered from time to time that its date was not very clear on its face and only one or two windows retained the original oak mullions. The date of erection was however on some portion of the lead work of the roof and was 1600 and something I forget the exact date, under the kitchen there was an arched reservoir for rain water collected from the roof and in the back kitchen a pump reaching to this reservoir; you may imagine that we were much more confined to the house than you are with a good garden to run in (by the time John was penning this letter the family were living in Eagle House). My father rented a Kitchen garden which was on the spot occupied by the long straight walk in the present castle grounds, I mean the walk reaching from the foot of the Castle Steps towards Bodmin road. We had the fruit garden which Uncle Pethybridge now has. I had one Sister by name Eliza Jane about 16 months older than I was, she was not strong and one of my earliest remembrances is of Sunday occurrences connected with her being doctored. You have portraits and very good ones of my Father and Mother , taken when they were about fifty years of age and when I was about 14 I cannot say I have any distinct remembrance of my Mother looking much younger than in the portrait, my Father’s likeness however was taken after a very severe illness of which I shall speak more in another place and he never quite recovered his good looks. Those of you who remember him will think of the old man with grey hair venerable and benignant, and you will hardly be able to imagine the young man, with fresh colour black hair an eye which though not unkindly made every body feel that when he said a thing he meant it. Active in body energetic in business, Master in his own house, sometimes the energetic rebuke almost amounted to asperity, but just and as a rule generous in his dealings and under all kindly a genial spirit. He was a thorough man of business and worked hard but he never let business interfere with the work of the Church of Christ, thoroughly converted when about 16 or 17 he retained his faith in Christ to the last, and during all the time I remember him, he had in the midst of a great deal of business always time for the week night services, prayer meetings, local preaching Sunday School and all the work of the various offices of the Methodist Church. He was a man of much prayer and believed in its efficacy and often have I known him when troubled by what he considered the wrong doing of others towards him go to his room spend some time in prayer and then come down quite joyous singing “Jehovah reigns be glad Oh Earth.” And one of the earliest lessons he taught me was to believe in the providential government of God. In about the year 1840 he had a most dangerous illness from the rupture of a blood vessel in the nostril the nose had to be plugged with tow until the rupture was healed, and then the plugs had to be taken out, those in the front came out easily but one at the back could not be removed, and it was feared mortification would take place, the Surgeon who was a good man, (Mr. Pearse now of Plymouth) and a Member of my fathers class went home and made it a matter of earnest prayer and when he came to me his patient again, the plug had come out of itself; they both considered it an answer to prayer – He was never the same man afterwards, though he recovered a good deal and lived to be an old man. I can never remember the time when he had not got a farm or a garden he was very fond of both and spent a good deal of time in the latter and was rather remarkable for the fine grapes he used to grow, we children used very much to enjoy going to the greenhouse with him for a good bunch. My Mother Ann Pearse came of a family who for many generations had been manufacturers of Woollens in Devon and Cornwall. They had been Presbyterians as long as any remained in this neighbourhood and for generations had been God fearing people but as the Presbyterian Churches became extinct or as in Tavistock became Unitarian, they worshipped with the Congregationalists where there were any, until Wesley and his preachers came into Devon and Cornwall when my Grandfather and all my great Uncles but one joined the Methodists – My great grandfather and his wife were members of the Presbyterian Church at Tavistock, (it was not then Unitarian) they usually attended the parish Church of St. Stephens where they lived but they always went the 1st Sunday in the month to Tavistock, he on a horse and she on a pillion behind – When he died he called his children round his bed spoke a word of counsel to each said “It is a pleasant path” and the quietly passed away his name was Robert his wife was a Miss Edye almost the last of a very respectable family of like mind with himself. My grandfather John Pearse I scarcely remember he was a very very kind old gentleman and carried on a blanket and serge manufactery at Sticklepath, the old factory is still there but used as a flour mill, the business was afterwards carried on by his sons George and Thomas, and many and many a happy day I spent in the dear old place, the old house still stands in the middle of the Village just opposite the Chapel they built, and in the graveyard they enlarged and so carefully tended are the remains of many very dear to me, there are few places so sweet in my memory as the woods and rock streams and moors of Sticklepath, but with Cousin Ellen’s Marriage to Dr. Thompson the last link was broken and the place seems very desolate now – My grandmother was a Miss Bate, of the same family as the Bates hereabout, but had been adopted and brought up by some one in St. Stephens, and there my grandfather married her. There are portraits or rather caricatures of both of them somewhere in the house – She was a clever woman very kind to her grandchildren and I have heard somewhat of a beauty in her younger days. My mother was one of nine children the eldest of five girls you have a very good likeness to her at 50, and a faded minature of her at 19, I am afraid sometimes that partiality to her leads me to describe her in terms too strong, for I loved and reverenced her in no small degree. She was a woman of strong sense clear judgement and general ability in all matters she took in hand; but gentle and tender beyond the ordinary run of women. If my fathers attitude in Christian life was strong faith, hers was loving adoration. The only drawback to her character if such it could be called was a vein of self distrust with a slight tendency to melancholy and doubt, but it never interferred with her duty to her family the Church or the world. She was a true helpmate for my father and in all his early business struggles assisted him in every way even to making up the interest accounts in the Bank. She was taken away just as we started the Bank in our own account and my father began a more prosperous career. When I was about ten years old my father took a farm at Bamham the road to it turns up just opposite Kensey Vean – There we used to go to live in the summer and I used to ride in to School on my pony George, my father and I dining together in the old house on a cold pasty and going home in the evening. About this time my father gave up the grocery business and attended only to the Bank and one or two other concerns he has in the Town. In the Bank he was really a partner with Gill & Co, but there was no deed of partnership and they repudiated the arrangements when it suited them to do so. My father had a tall bay horse called Lancet because it once belonged to a Doctor which he used to ride, and I have a very vivid remembrance of its being brought to the door of a Sunday morning, by Richard Bowhay from the farm at Bamham for my father to ride preaching and many a time has it carried him to the distant places now comprised in both the Launceston and North Hill Circuits, sometimes I used to ride with him on George. My earliest associations are of course connected with the old house, and as we had no garden I spent a good deal of time as a little one at the sitting room window looking unto the Broad Street. Flogging publicly was a common punishment till the Criminal laws were amended under the direction of Sir Samuel Romilly and others and I think I remember the last public flogging in Launceston I could not have been more than 6 years old but I could see a crowd from the sitting room window and was told that a young man was tied to the pump, you see marked on the plan and whipped, for theft – previous to this thieves were tied to a carts tail, this cart was drawn slowly through the streets and the culprit flogged on his bare back as the cart moved on, I am not sure but I fancy I once saw a crowd from the window and was told that it was some one being whipped through the Town. I have heard of many such cases however and there is no doubt that such punishments took place. 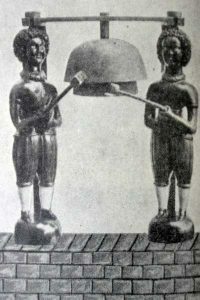 The two figures (below) in front of the Market clock which strike the quarters once stood in front of a clock between Roger’s house and the Town Hall and we as children were told that they were effigies of Nicky and Tommy who had been flogged through the Town for stealing. Twice a year there was a grand sight from the sitting room window when the assizes were held in the Town the judges always lodged at Mr. Chimps, now Olivers. The assize Court was the Town Hall. The sheriffs carriage with a troop of javelin men in the sheriffs livery would draw up at Mr. Chimps and take the judges in state across to the Town Hall. The trumpeters blowing the usual flourish. There was more pomp about the assize then than now and many sheriffs brought their own tenant to act as javelin men. The assizes were grand times with the people of Launceston. Every house was turned upside down and every one let lodgings to the barristers and attorneys. Every important thing that came into the Town was seen from that wonderful window from the penny peep show to the judges carriage. It was a great event to us when a wild beast show came to the Town. They usually encamped in the Broad Street immediately under our windows never stayed less than a week and often a fortnight. It was a matter of great excitement to us children to listen to the roaring of the beasts, and sometimes when the wind was high and would lift up the awning to be able to look in without paying. It was a great pleasure on Saturdays and fair days to watch the market. Instead of monthly markets we had then only two or three big fairs in the year and coming more seldom they caused more excitement about them than now. St. Leonards fair on the 17 November was the biggest fair of all and the noise began long before light in the morning. I have heard of cattle being sold by lantern and candle. One of my principle pleasures was a visit to Netherton (Rilla Mill). I used often to ride out with my father for a day and sometimes in the holidays used to stay for a week or more, and so got very familiar with the place Uncle John was always pleased to see me and was very kind. I think I was fortunate in having two such pretty places as Netherton and Sticklepath to go to. My first Schoolmistress was Miss Eyre afterwards Mrs Cope she lived with her brother Mr. T. S. Eyre in the same house where his nephew Mr. I. S. Eyre now lives and the schoolroom was somewhere on the first floor – Dr. Greenaway now of Plymouth is almost the only schoolfellow I remember. I suppose I must have learnt my letters there. After Miss Eyre married Mr. Cope I went to school there first with Mrs. Cope and then with Mr. Cope they lived in the house now occupied by Mr. Gifford and John Heath at Bellevue. Mrs. Cope kept her school downstairs in what is John Heaths front room, and Mr. Cope in the large room upstairs the pupils who learnt drawing pursued their art in the room over again. At what age I was promoted from Mrs. Cope to Mr. Cope I cannot remember, nor what I learnt with Mrs. C. except to read the first Chapter of John and other parts of the New Testament. I left Mr. Cope when I was between 12 and 13 that is in June 1841 and was sent to school at Bath with Messrs. Shaw and Bradnack Devonshire Place. There was no railway then nearer than Taunton and we had to start at 2 o’clock in the morning by coach. At that time my sister was at School at Bristol and we travelled together. I think on the first occasion my Cousin William Pearse then of Sticklepath now of Plymouth took charge of me and I broke the journey at Sticklepath and Bristol but usually we got into the coach in the early morning as I have said some kind friend would perhaps at my mothers request see us at Exeter and then we went to Taunton and got into the train there and so to Bath. The coach journey gradually got shortened by the opening of the Railway first to Bearns Bridge then to Heal and afterwards to Exeter. I remained at School until the Xmas after I was 16 and I cannot tell you the value I place on the 3 1/2 years I spent there. Mr. Bradnack had the principal charge and he had a wonderful capacity for making boys think. If it had been the custom then as it is now for boys to stay at school until they were 17 or 18 I think I might have made a decent classical scholar. Among my schoolfellows were Richard Rowe who became a somewhat celebrated writer for some religious periodicals and died a most melencholy death of Cancer in the mouth. Charles Ford now keeping school in Camborne, a most precocious lad and wrote capital poetry at 16. Robert Hall Baynes (son of a Congregational Minister who became a Clergyman) was offered a Bishopric at Madagascar, and published a Book of poems now in the Book Case. James Vanner and Mrs. Vanner silk merchants and manufaturers in London. Both members of Conference.